Last Sunday was Grant’s birthday and we decided to bird our local area in search of something special. We drove out of town a bit, as we had not seen Black-tailed Treecreepers yet this year and wanted to! There’s a good spot for them and we had several climbing up tree trunks looking for food. We often get Varied Sittella in the same area and they are half the size, but also spend much of their time on tree trunks looking for food amongst the bark. I noticed a silhouette and we investigated and we got our first Pallid Cuckoo for the year. We discovered another juvenile not far away, so other species have had their eggs swapped out. 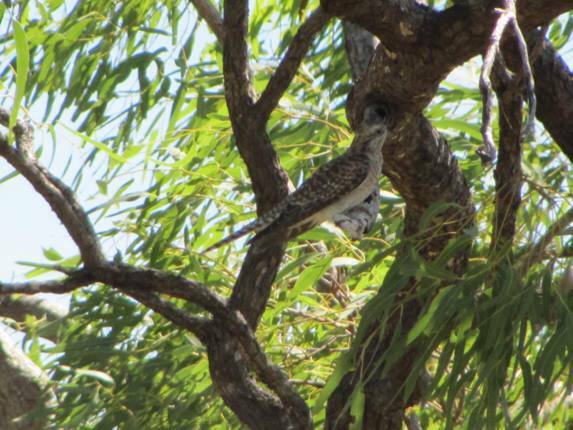 They tend to use Honeyeater or Magpie-lark nests. We then ventured off around some flooded areas from our recent “Wet Season” to see what was about. There are not as many waterbirds as you would expect, but this will be because there is just so much water everywhere still. After a walk we returned to the car and I looked ahead down the track and immediately put my binoculars to my eyes, because I could not believe what I thought I was seeing. I was in shock-GET THE TRIPOD AND SCOPE FAST-DO NOT ASK WHY! Grant just looked at me and looked at what I was showing him and grabbed the telescope to see what it was. Sure, it looks like a pair of Pied Oystercatchers sitting under a bush, but we are not on the beach! 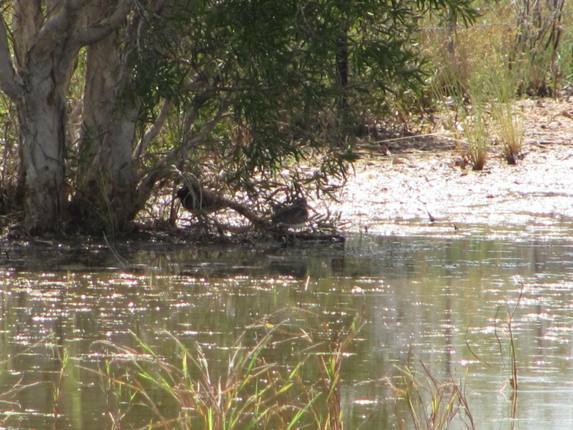 Now, we never dreamt of finding our first pair of Painted Snipe around Broome….well we actually never really thought we would see them anywhere really except by pure good luck. There is very little information on this species of bird and it is believed that there are only 1500 in Australia. 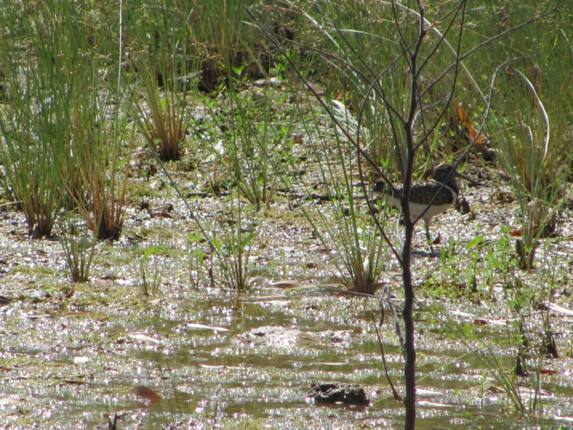 They are not actually closely related to true snipe Gallinago spp and their flight action is similar to a jacana or rail. We would have thought we would have had half a chance of seeing one of these birds in a swamp in southern Australia-if we lived there and spent all our spare time in swamps! I really had found us something special. Now a birthday present is nice, but sometimes nature can do so much better and Grant thinks I did well this year! We moved slowly closer and hoped to get better photos as we had doubts that we would be believed! They are supposed to “freeze” rather than fly and are supposed to be “lethargic” during the day-well that’s two things in our favour, but can we really get a better look? We kept looking at the birds, looking at each other wide-eyed and slowly moving forward-we didn’t care about the thick mud! Well, they came out and crossed the track and walked into the long grass on the other side and I was able to get a few photos. I should have photographed the grins on our faces! As you can see, the female bird has a lot more colour than the male. These birds are listed as a Threatened Species in Australia, so we have reported them to the relevant authorities. There have been reports of them breeding in the 1960’s near Derby, which is over 200kms away. The last one seen in the area was in 1999. We stopped nearby for a picnic lunch in the bush and had a walk afterwards. Nothing could compare to what we had just witnessed, but we did have two rather hilarious events. Firstly I almost stood on a Buff-banded Rail and we were both in shock, but it was in even more shock when a Brown Falcon almost took it out of the sky. My heart rate had just slowed down when Grant almost stood on three Brown Quail! At least we didn’t see any snakes! Grant now has a big problem. I got him a GOOD birthday present, but what will he be able to find for me next Sunday? Do we have to make this a “share” birthday present?!!! Congrats, Clare and Grant! I’d love to see a Painted Snipe on my birthday, or any other day really. An awesome spot! 1500 over the whole of Aussie, those are long odds. 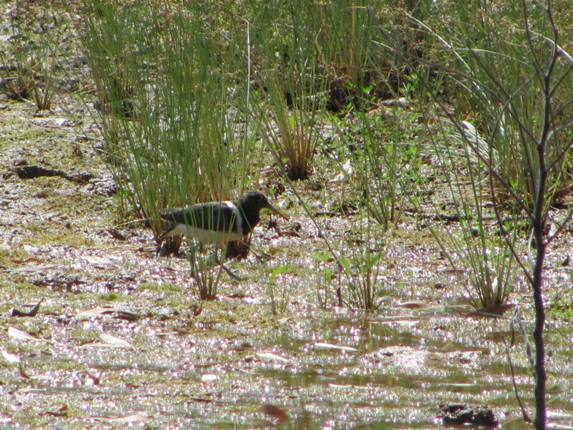 @ Mike and Duncan-the odds were hardly good, but I am pleased we went birding rather than buying a lotto ticket!